Cane Corso Rehoming and adoption listings. Find Cane Corsos for private adoption and also Cane Corso mix dogs and puppies for adoption by owner in the USA and Canada. Adopt a Cane Corso today. 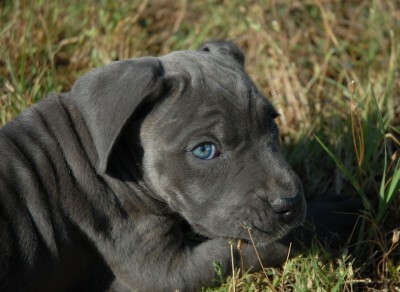 Need to Find a Good Home For Your Cane Corso Dog or Puppy? 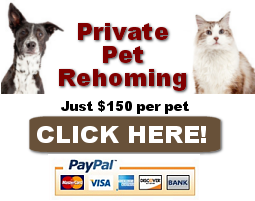 Pet Rehoming Network offers expert help in rehoming Cane Corso dogs and puppies throughout the USA and Canada. If you need help finding your canine companion a good home safely, effectively and permanently, please request our dog rehoming services today! 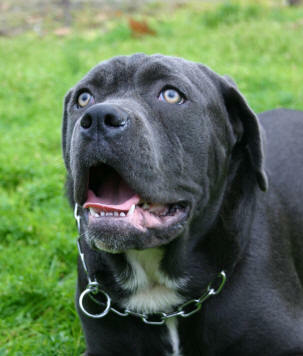 Questions about our Cane Corso rehoming services? Click Here! Direct, home to home dog adoption is the kindest and most stress-free way to find your Cane Corso a good home. Our dog rehoming team will help your Cane Corso dog shine, attracting the right potential adopters and helping you avoid the wrong ones. We carefully screen applicants before you meet them, ensuring the safety of your dog and your family. We protect your privacy by advertising on your behalf. Your personal and contact information is never shared with the public, and any contact with potential adopters comes from you reaching out to them, after their application has been carefully and thoroughly screened by our rehoming team. Looking for a Cane Corso dog for private adoption? Get on our waiting list, or check out the dogs and puppies listed for direct home to home dog adoption by owner below. You will get to know all about a dog from the people who know the dog best – the owners. Most private Cane Corso adoptions include supplies and veterinary records. Adopt a pre-loved Cane Corso today. A direct descendant of the old Roman Molossian, “Canis Pugnax”, the Cane Corso has long been a companion of the Italian people. Used in battles, for hunting large game, as a personal guard dog, and as a drover that would help to drive the cattle to market, it’s no wonder that the Cane Corso was so favored throughout Italy. The Cane Corso is a wonderful breed of dog for the right family. However, this breed does require a great deal of work and is not for everyone. Extremely loyal and devoted to the family, they can sometimes be overprotective, and so early socialization is essential. Dominance issues are common with this breed, so establishing dominance is very important and the entire household must be both consistent and confident when working with the Italian Mastiff puppy. Even methods of play must be monitored and directed with thoughts of the adult Cane Corso in mind. While it’s a very tempting to wrestle with a small Cane Corso puppy, one must keep in mind that this puppy will rapidly grow into a dog they can weigh as much as 140 pounds. If you’re a dedicated pet owner, with the time to devote to properly training a puppy such as this, the Italian Mastiff makes an excellent pet and may be just the dog for you! It’s said that there are two direct descendants of the original old Roman Molossian, the first being the dogs that would eventually create the heavy and intimidating Neapolitan Mastiff. The second descendant bore similar Molosser traits, but was of a lighter and more athletic build. This dog is believed to have become the Cane Corso, or Italian Mastiff. Considered to be a coursing mastiff, his leaner build and lighter weight made him an ideal hunting dog; not only was he capable of running down prey, but he still possessed this size and strength to be able to bring the prey down once he had caught up with it. Judging by Italian art and various records, the Cane Corso enjoyed plentiful numbers throughout Italy for many years. However, with tightening belts and the threat of war, Cane Corso numbers dwindled until he could only be found in this southern parts of Italy and was considered to be a rare breed. Nevertheless, fans of the breed have done wonders to preserve the Cane Corso – even today, he can be found performing typical drover tasks and providing the same loyal services throughout his native country, that he has for hundreds of years. The Cane Corso is a very sturdily built dog, without appearing heavy or cumbersome. If anything, his build is leanly muscled and elegant. Somewhat longer than he is high, the breed stands between 23 and 28 inches tall at the shoulder and males can weigh upwards of 130 pounds. Don’t let his size and weight fool you however, the Cane Corso is an athlete through and through and was commonly used to hunt wild boar and stag during mediaeval times. Cane Corso puppies can be found in a wide variety of colors including black, red, light or dark fawn, three different shades of gray (lead, slate or light gray), black brindle, chestnut brindle, and a grey brindle (tubby). Fawn and brindle dogs may have either a black or gray mask and limited white markings are acceptable, divided they’re not excessive. The ears of the Cane Corso may either be cropped or left natural. Likewise, the Cane Corso tail – when docked, it is taken off at the fourth vertebrae and should either hang in a vertical position or be carried horizontally but never curled up over the back. His dark almond-shaped eyes are lively and intelligent, with yellow or blue eyes considered to be a disqualification. 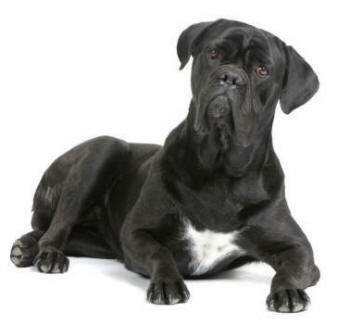 The Italian Mastiff is known for his very calm, well balanced and loyal temperament. When properly socialized, he is a very gentle and patient with children in the home and other pets. However, the Cane Corso can be very protective of his family and wary of strangers. Like many giant dog breeds, the Cane Corso has a shorter life expectancy than many smaller breeds of dog. However, choosing your Italian Mastiff wisely can help to ensure that you have a healthy dog that will live well into old age. Prior to purchasing an Italian Mastiff puppy, you should take the time to get to know potential breeders and to discuss various health concerns within the breed. Cane Corso puppies grow at an amazing rate. For this reason, it is essential to establish basic obedience training and prevent risk of dominance issues. The Italian Mastiff is known for his protective and loyal nature, but he should still be submissive to all members of the household. This is best established by starting training your Cane Corso puppy at a very early age. Puppy obedience courses are in excellent way to help your Italian Mastiff learn basic behavior expectations, as well as early socialization steps. While the Cane Corso are does enjoy his exercise, he is hardly hyperactive and can be well suited to apartment living, provided he has access to daily walks or a chance to exercise that the local dog park. Additionally, it said that the Italian Mastiff makes an excellent jogging partner! If you were looking for a running partner, you may find this athletic dog the ideal companion. Grooming your Cane Corso is relatively simple. A light shedder, a weekly brushing with a bristled brush can help to remove dander, dead hair and add a beautiful shine two your Cane Corso puppy’s coat. Pay careful attention to your Italian Mastiff’s ears and any wrinkles, checking weekly for build up of dirt, foul odor, or signs of redness or infection. Want to adopt a Cane Corso dog or puppy? 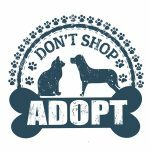 Pet Rehoming Network’s Cane Corso Adoption list helps unite Cane Corso owners who can no longer care for their companions with dog lovers looking to add a wonderful pre-loved Cane Corso to their lives. Find Cane Corsos for adoption by owner throughout the USA and Canada on Pet Rehoming Network.